The last couple of months in the Mid-South have seen very little rainfall and what rain has fallen has not been well-distributed, leading to lengthy dry periods and the development of "abnormally dry" conditions. 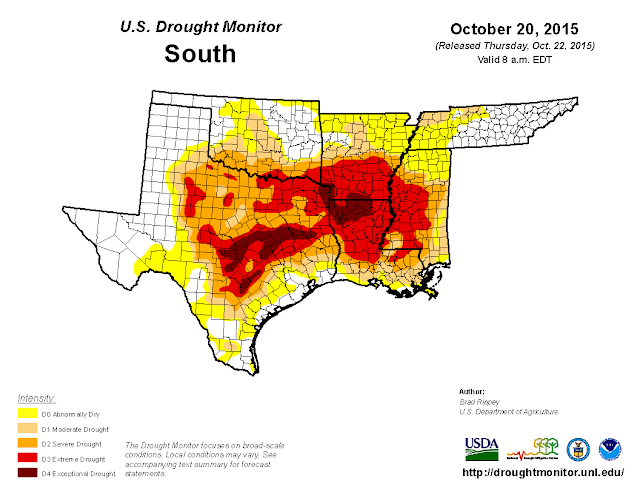 "Severe drought" conditions lurk just to our southwest in the Mississippi Delta. 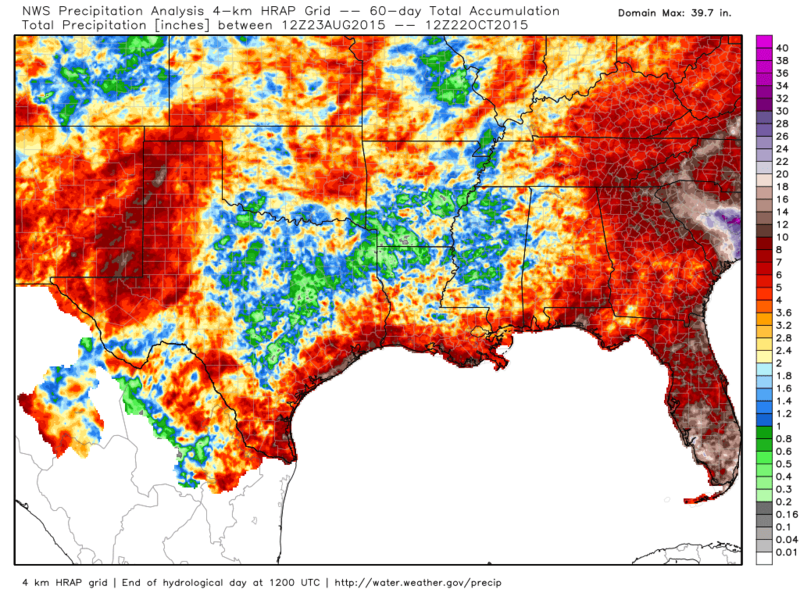 Total rainfall for the past 60 days across the south reveals a lack of precip along the lower Mississippi Valley and back into eastern TX. Graphic courtesy WeatherBell. 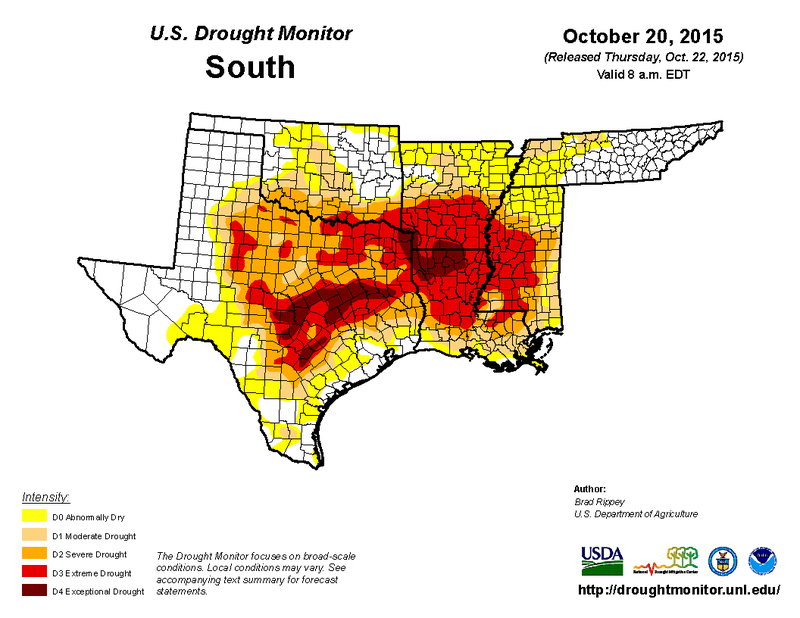 Conditions are "abnormally dry" across the metro with severe and extreme drought just to our southwest. In fact, at Memphis International, after a wet start to August, there have been just a few days with enough rainfall to really matter much, and almost none since mid-September. If you throw out September 9th with just over 1" of rain, less than 0.25" has fallen since September 1 and only 0.03" for the month of October! 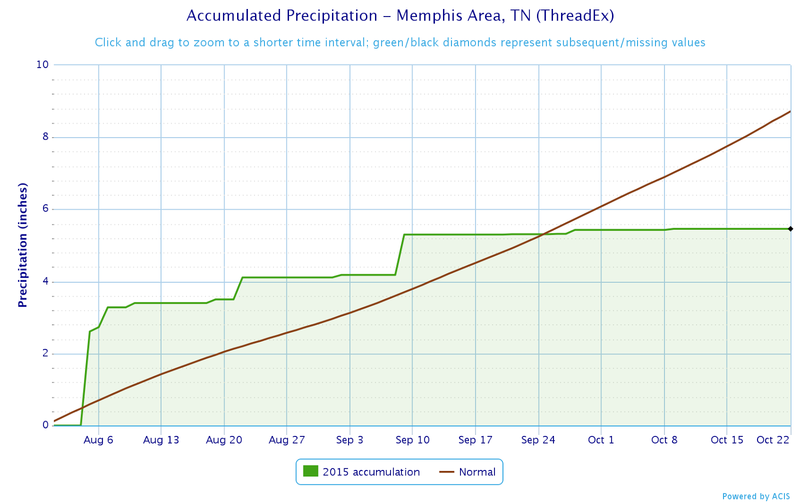 Precipitation accumulation (green) since August 1 at Memphis Int'l vs. average (brown). Memphis is now 6" below average for the year. However, Mother Nature tends to have a way of balancing out over the long haul and this weekend will likely make a dent in the rainfall deficit. 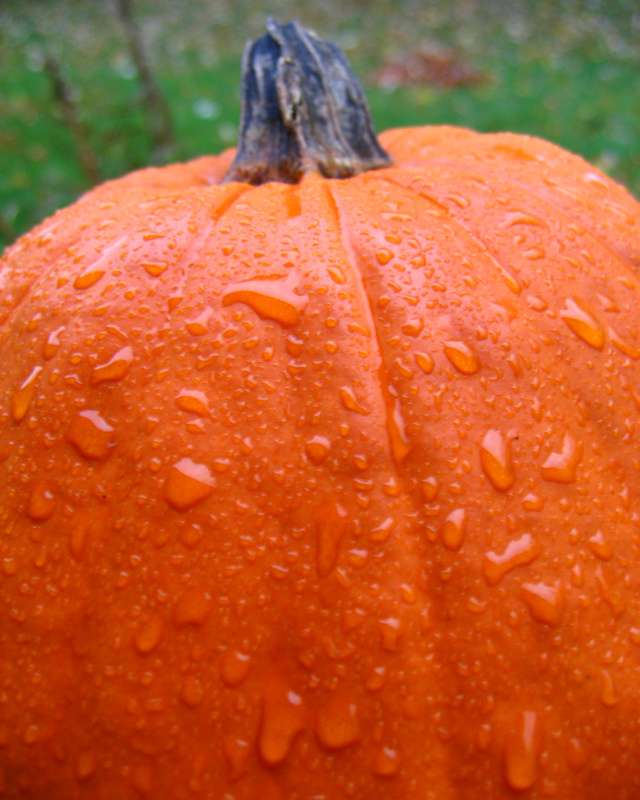 Unfortunately for those who count on nice fall weather this time of year for outdoor activities, many could be impacted by the rain. Upper level ridging (or high pressure) that has influenced the Mid-South this week is transitioning to a southwest flow pattern, bringing moisture into the area from Hurricane Patricia off the coast of Mexico. Also, an upper level low that has been over the southwest U.S. begins to lift into the central portion of the country. This combination will mean increasing rain chances a bit as we head into the afternoon and evening hours on Friday. Fortunately the rain appears light. Friday night into early Saturday could see higher rain chances as an upper level disturbance moves across the area, though scattered showers are the most likely outcome. The Saturday forecast has been the trickiest all week and computer models still don't have a good handle on the situation, leading to lower confidence than I would like in the forecast. It appears that the heaviest rain could fall just north of the metro, but there's a good chance we'll see more scattered showers or periods of light rain during the day. We're not expecting a complete washout, but there could be multiple periods of rain. Also, mid-level instability will rise a bit on Saturday afternoon so we can't rule out a few rumbles of thunder as well. National surface map for Saturday evening showing the approaching frontal system and moisture from Texas moving north along the front and across the Mid-South. Saturday night could be wet as a cold front moves into the region and stalls out, which could lead to periods of rain, perhaps moderate at times. These showers will linger into Sunday as the front remains in the area, though once again computer model data is less than convincing on the amount of rain to expect. The NWS indicates that we could see a total of 1-2" of rain by Sunday evening for much of the area with beneficial (and perhaps too much) rain across much of the drought areas in the Southern Plains and areas west of the Mississippi River. Forecast rainfall amounts from the NWS through Sunday evening. 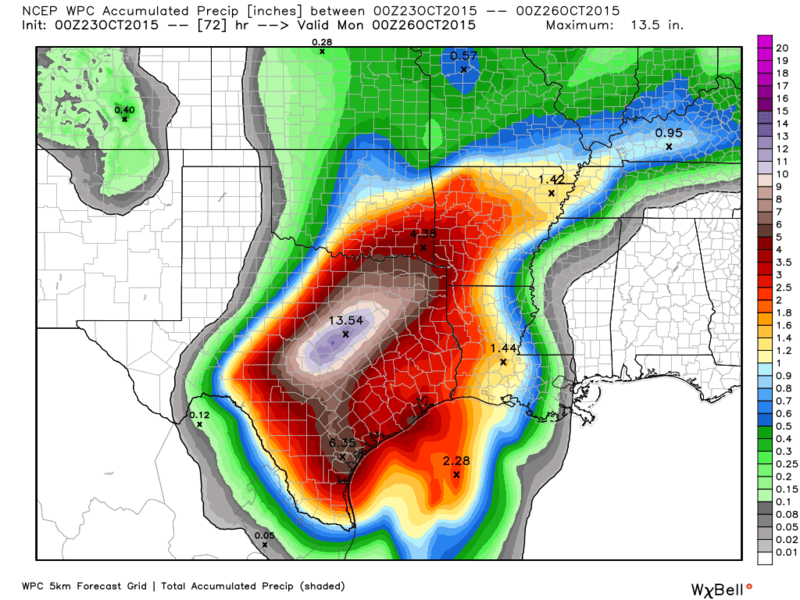 Flooding will be a concern in TX and southern OK while beneficial rain is expected in the Mid-South. Graphic courtesy WeatherBell. 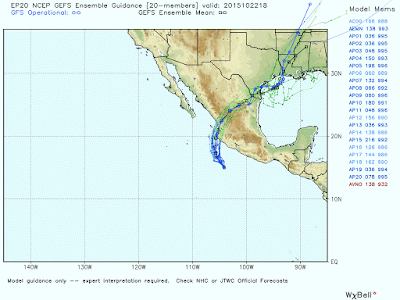 Also this weekend, as we're dealing with rain locally, Hurricane Patricia will make landfall in western Mexico with remnants expected to cross northern portions of the country and emerge in the western Gulf of Mexico early next week. After doing so, what could be a subtropical low will strengthen off the Texas coast and move northeast. In doing so, it could very well end up moving across the Mid-South. Model solutions for the low associated with Hurricane Patricia, indicating a northeast track, possibly right into the Mid-South. Graphic courtesy WeatherBell. Timing on this system is still TBD, but we'll be keeping an eye on Tuesday and Wednesday fairly closely. Should it track across the region, periods of heavy rain and some gusty wind could well be the result, putting a bigger dent in the lingering rainfall deficit as we close out the month of October. Stay tuned! For the latest forecast information, check out MemphisWeather.net, MWN Mobile web, and our mobile apps, as well as our social media feeds. As we drove into town last evening from a few (well-deserved I might say) days at the beach with family, a huge plume of smoke emanated from the area around I-40 and Sycamore View near Bartlett. I didn't know what was on fire at the time, nor did I realize (since I had been away from detailed atmospheric analysis since late last week) what the ramifications would be this morning. However, an early glance at Twitter this morning and then a drive through Bartlett on my way to work quickly made clear the situation. A combination of fire and smoke continuing through the overnight hours from a huge mulch fire and a surface-based "thermal (atmospheric) inversion" had created a very smoky commute through central Shelby County! Photos taken about 8:30am Wednesday. 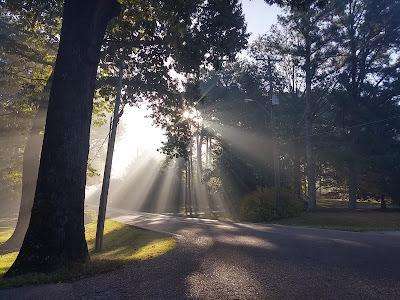 This one was several miles northeast of the mulch fire, but smoke was still present in the air, creating a beautiful set of "crepuscular rays" through the trees. 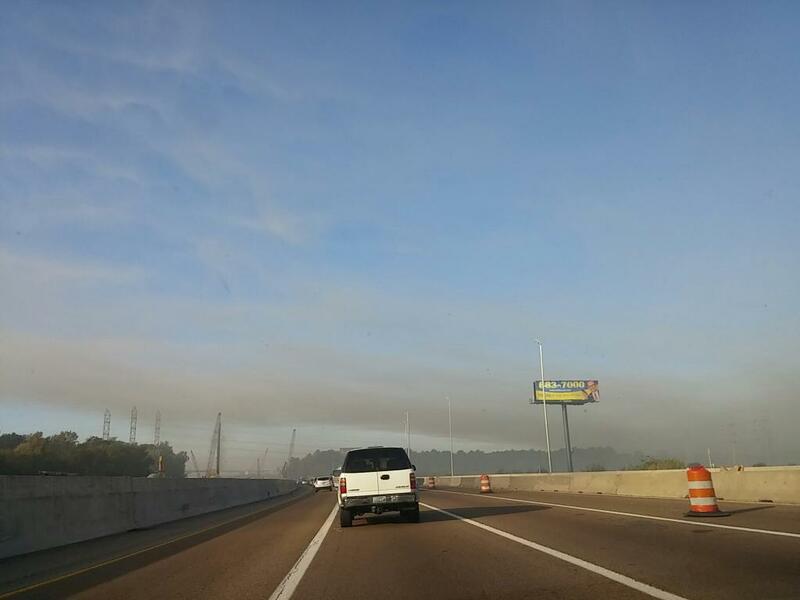 Approaching I-40 southbound on Sycamore View, the smoke got thick and acrid with visibility below 1/2 mile (note you can't see the I-40 overpass from Summer Avenue, a distance of 0.6 mile). 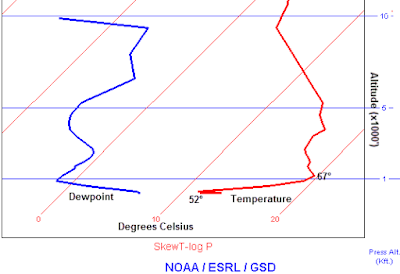 A surface-based inversion is created when the lowest level of the atmosphere (typically a couple thousand feet above the ground) cools more quickly than the layer above it. 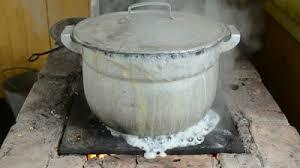 This is not uncommon and, in fact, occurs more often than not when the wind is light to calm. 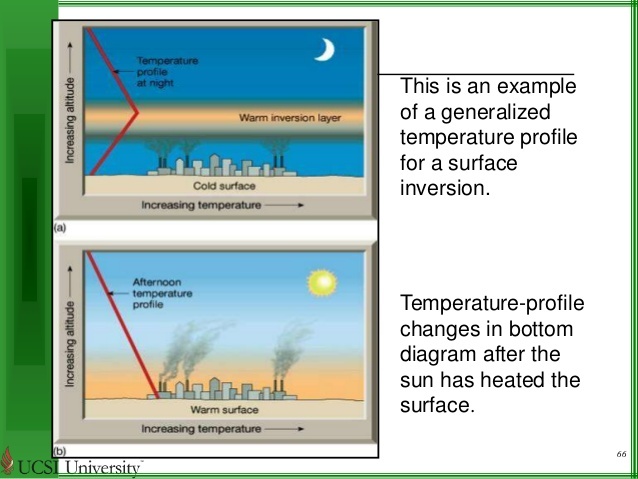 When an inversion is in place, the temperature actually warms with height, instead of cools (which is the typical thermal profile during the daytime). The typical setup during a surface-based inversion and after it dissipates, courtesy UCSI University. An aircraft sounding from Memphis International shortly before 7am Wednesday shows the temperature (in red) rising from the low 50s at the ground to the mid 60s at 1000 feet before falling slowly above that height. 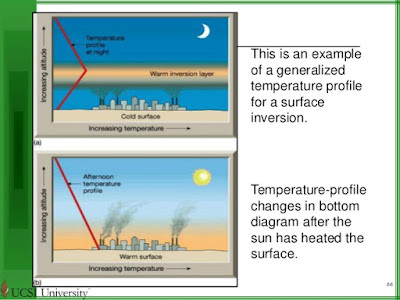 The pronounced temperature increase is the " thermal inversion" which effectively "capped" the polluted surface-based air from escaping. The warming air creates a sort of "lid" on the lower atmosphere, trapping it near the ground and disallowing smoke, fog, smog, etc. from dissipating upwards. It's not unlike the "cap" we talk about relative to summertime thunderstorm development, only this inversion occurs close to the ground, not in the middle layers of the atmosphere. The "strength" of the cap, or inversion, is determined by the difference in the temperature between the cool air below and warmer air above. Sometimes it is only a few degrees, sometimes much more. The stronger the inversion (or bigger the temperature difference), the stronger the "lid" is between the low levels and the air above. This morning, the inversion was very strong! In fact, outside the city, temperatures were in the mid 40s (lower 50s in the city) and the warm layer above the ground was in the mid to upper 60s. That's a 15-20°F inversion! The other interesting feature about this morning's inversion was that it was based very close to the Earth's surface. That warm layer in the mid 60s was only about 1000 feet above the ground. That means if you were to go up 1000 feet, it would be 20° warmer than at the ground. It also means that all that smoke was trapped in air that was only 1000 feet deep. If it were 2000-3000 feet thick, the smoke would have had much more air (by volume) to disperse through. Instead, it spread out at the surface rather than escaping up. As we know, smoke is not something you want to be breathing, as it is harmful to the lungs due to particulate matter that is an ingredient in the smoke. This morning, a Shelby County Health Department air monitoring station at Shelby Farms actually went "code red" for a while due to the harmful particulates in the air. (It's a good thing there wasn't a station at the Summer 4 Drive-In!) 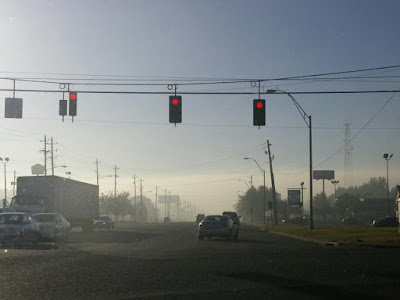 The Health Department issued a statement indicating that those with breathing issues or other illnesses stay indoors and others not exert too much energy in the affected areas. An air quality monitor operated by us at Shelby Farms recorded levels of particulate matter at a concentration considered unhealthy. At the levels being recorded at this one monitor, everyone may begin to experience health effects. So how did the majority of the low-level smoke (outside of the source of it at the fire site) dissipate? The inversion disappeared as the low level temperatures warmed. As soon as the lowest 1000 feet of the atmosphere rose into the mid 60s (which occurred by mid-morning), the inversion was gone and air from the very low levels could mix with the air above, allowing the smoke to rise and disperse into the atmosphere above the morning inversion. However, the Health Department indicates that a Code Orange air quality alert remains in effect through midnight tonight, which means the air continues to be "Unhealthy for Sensitive Groups." We have issued a “CODE ORANGE” air quality advisory for fine particulate matter due to an expected monitored exceedance. Sensitive groups include the very old and young and anyone with respiratory disorders or cardiovascular problems. So, the takeaway is that while an inversion is not rare, it was simply stronger and lower than usual this morning and we had a source of pollution to gauge just how it works. You can "breathe easier" now that you got your weather 101 for the day! How bad was the smoke where you live or work? 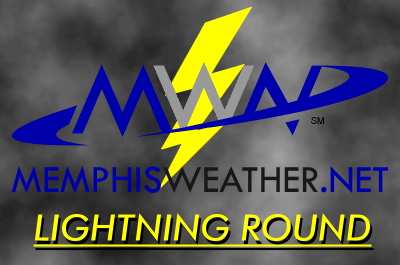 It's time for another edition of the MWN Lightning Round! Today we tackle a couple topics related to recent events on the east coast and tropics, as well as take another quick look at the weekend forecast, which has changed a bit in the past couple of days. Early last week, eyes turned towards the warm waters of the Caribbean as Joaquin spun up and quickly became a major hurricane as it churned into the Bahamas where above average warmth and low wind shear aided rapid development. There's been a lot of talk in the aftermath (when you can break through the conversation about SC flooding, which is definitely worthy of plenty of it!) about the performance of the American (GFS) model vs. the European (ECMWF) model. 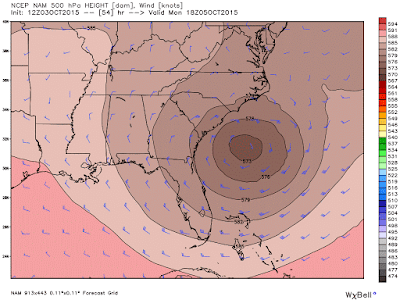 Once again, the ECMWF handily beat its American counterpart on the forecast track of Joaquin, indicating that the nearly 10-year long streak of no major hurricane landfalls on U.S. shores would remain intact. While the European model nearly pegged the eventual track of the storm as early as Monday night, the GFS didn't release the east coast from its sights until Friday morning (after the storm had reached the Bahamas) and took another 4 model runs (24 hours) to correctly show that there was a higher threat to Bermuda than the Canadian Maritimes. Credit goes to the National Hurricane Center for keeping the official forecast track off the east coast and not issuing tropical watches on U.S. soil in deference to the European model, despite the consensus of the rest of the models showing an eastern U.S. landfall. The European model forecast for Hurricane Joaquin as of Monday night, September 28th, correctly showing a trip into the central Bahamas, followed by a turn to the northeast, close approach to Bermuda, and eastward turn south of 40° north. Graphic courtesy WeatherBell Analytics. Used with permission. The American (GFS) model forecast for Tuesday night, September 29th, showing landfall near Norfolk, VA and significant direct impact to the Mid-Atlantic region. 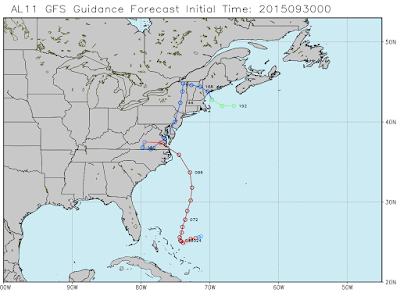 This forecast was made 24 hours after the above track produced by the European model. 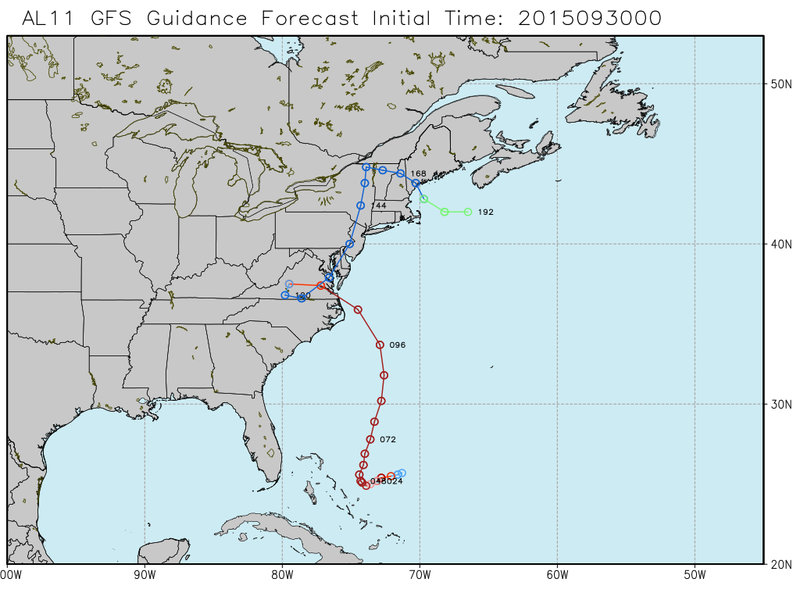 The GFS didn't eliminate direct impact to the U.S. as a possibility until late in the week. Graphic courtesy WeatherBell Analytics. Having followed these models regularly for years, my primary comment here is this: the American model generally does a very good job in the short to medium-range (out to a week) and compares favorably with the European model in general. 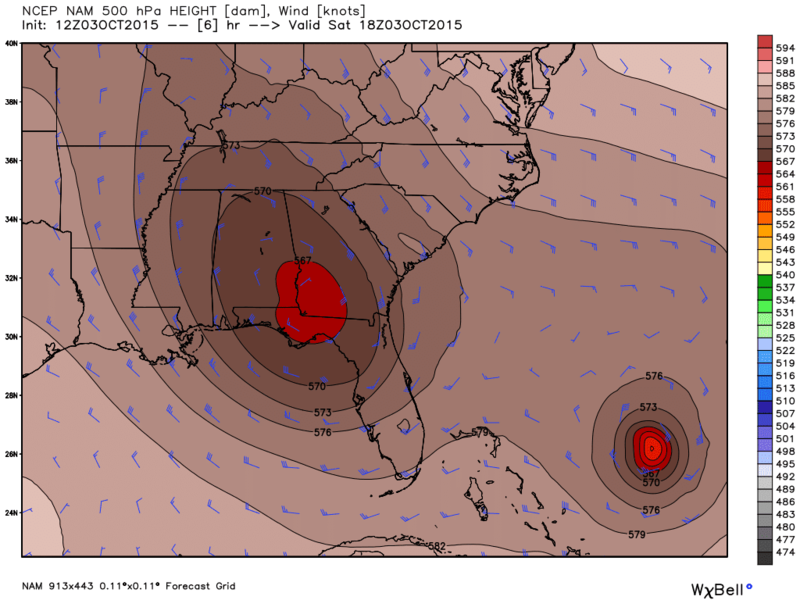 However, when the spotlight is on (Hurricanes Sandy and Joaquin immediately come to mind), it has fallen short. What must not be forgotten is that the massive northeast blizzard that was predicted to bury NYC last winter (and ended up being a "regular snowstorm" for a well-prepared northern metropolis) was actually best forecast by the American-made GFS, whereas the European led forecasters astray, at least in the area that gets the most media attention, the Big Apple. What is a 1,000-year rain event? Since we're talking about Joaquin, this is a good opportunity to discuss another misunderstood, and unfortunately poorly-explained, topic (at least by the mainstream media) that we've all heard in reference to the historic flooding this past weekend. Portions of South Carolina received a 1,000-year rain event. What does that mean, besides that it is historic, catastrophic, and devastating all at the same time? Let's start with what it is NOT. First, it was not a 1,000-year FLOOD event. That is different from a 1,000-year RAIN event. A 1,000-year rain event does NOT mean that: a) it's been 1,000 years since the last rain of this magnitude, despite what Stephen Colbert or the Governor of South Carolina says, b) it'll be 1,000 years before this much rain falls again, or c) it only rains this much every 1,000 years. A 1,000-year rain event actually means that there is a 1/1,000 chance that a certain amount of rain will fall in the given period, or that there is a 0.1% chance of it occurring. Could it occur again next year? Sure! A good way to describe this (and credit to the CoCoRaHS blog for this great example) is to imagine 1,000 ping pong balls in a box. All but one are white, the other is red. With your eyes closed, you pull a random ball out of the box. You have a 1/1,000 (0.1%) chance of grabbing that red ball. You then put that ball back in the box, mix them up, and grab a ball again. Once again, you have a 0.1% chance of pulling the red ball. The fact that you picked it out the first time does NOT affect your chances the subsequent time. Therefore, a 1,000 year rain event may not happen for 2,000 years, or you may see it much more often than every 1,000 years! The last comment on these "recurrence interval" events, whether 1,000-year, 500-year, or 100-year event, is that the amounts of rain vary significantly from one place to another. For example, for Memphis, a 1,000 year rain event is 10.64" in 24 hours, while in Phoenix, it is 4.82" in 24 hours. Also, average recurrence intervals are calculated not just on 24 hour rainfall amounts, but on several different timeframes. 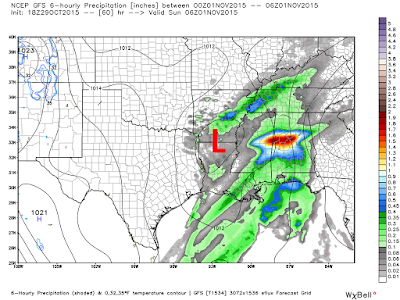 The recurrence intervals for Memphis are shown below. 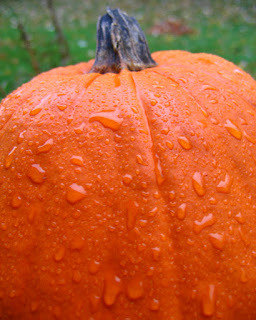 As an example, a 100-year rain event is 8.02" in 24 hours or 3.20" in 1 hour. Average recurrence intervals for precipitation events for Memphis, TN. Data courtesy City of Memphis/Shelby County Storm Water Management Manual. In a post earlier this week, we discussed the warm weather mid-week (which we're experiencing... mid 80s can leave anytime thank you) and the passage of a cold front on Friday. That post mentioned minimal rain chances with the front, but computer models are picking up on more moisture along and behind the front and we've added a 30% chance of showers and maybe a few thunderstorms to the Friday afternoon forecast, as well as a 40-50% chance of evening showers. 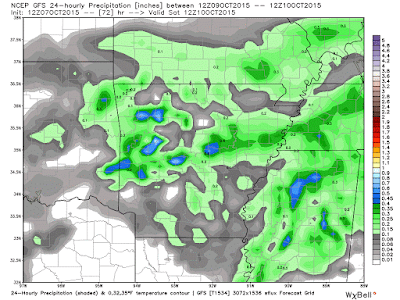 GFS Wednesday morning forecast model of total rainfall for Friday and Friday night. Graphic courtesy WeatherBell Analytics. The good news: we could really use some rain after a dry month, so a quarter inch of liquid will be welcome for some, plus it'll be gone for the Columbus Day weekend, so expect cooler and drier conditions Saturday and Sunday with clouds departing by mid-day Saturday. The bad news: you might need a poncho or umbrella at any Friday night events outdoors, including football games and the Levitt Shell concert. If forecast trends hold, we could see a steady rain during the evening with north breezes making it feel a fair amount cooler than the daytime hours when highs will reach the lower to mid 80s. Keep abreast of the latest forecast conditions from MWN with our mobile apps, perfect for checking radar and our human-powered forecast while out and about. Links to download can be found below. For those who didn't like the cool fall weather over the weekend - whether it was because it was too early in the year or because no sun accompanied the chilly temps - you're in luck. Temperatures are climbing back to above normal readings for the rest of the week with a taste of late summer returning in the form of mid (and maybe even a few upper) 80s highs. You can thank the departure of a large upper level low from the southeast U.S. (one that funneled tremendous moisture from Hurricane Joaquin into the Carolinas) and building high pressure for the climbing temps. In fact, much of the nation will be under upper level ridging between the lows over the Atlantic (one off the SE coast and one associated with Joaquin) and another low in the southwestern U.S. Fair weather, with a mix of clouds and sun, will dominate the rest of the week as those temps climb under the upper level ridge. The upper level (35,000') map for this evening shows ridging over the Mid-South between low pressure in the Desert Southwest and over the east coast. As we head towards week's end, a front will sink south into the region. However, little upper level support accompanies it, so though clouds are expected, rain chances appear fairly minimal. Bad news for those who, even at this time of year, depend on some precipitation and haven't gotten much of it the past 30 days or so. Any rain chances would likely be highest from Friday to early Saturday. Forecast rainfall for Thursday night through Saturday indicates very little precipitation expected across the Mid-South. Following the front, somewhat cooler weather arrives again for the weekend, but only briefly as a ridge of high pressure re-builds and pushes temps back above normal for next week. The long-range outlook from NOAA for next week indicates a high likelihood of above average temperatures for a large portion of the nation. NOAA's temperature probability map for week 2 (Oct. 13-19) shows a high probability of above average temps for most of the nation. You can always get the latest forecast information, current conditions, radar, satellite, and severe weather outlooks via the MWN mobile apps for Android and iOS. Also be sure to check out our StormWatch+ severe weather notification service within the app! September typically begins the welcome decline in average temperatures and is one of the driest months of the year. This month definitely lived up to the usually dry pattern, but temperatures were slow to depart from summertime trends. Temperatures ended the month nearly 2.5 degrees above normal. Precipitation-wise, all but 0.20" of the rain that fell occurred on one day. Over the past two months, the vast majority of precipitation has fallen on just a few days, leading to "abnormally dry" conditions appearing in the Horseshoe Lake and Tunica County portions of the metro, according to the U.S. Drought Monitor. 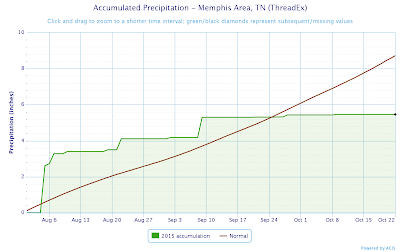 Through September, Memphis International Airport's annual rainfall deficit is 3.18", or about 92% of normal. There was no severe weather in the Memphis metro during the month of September. In fact, no thunderstorms were reported at the airport for the entire month. Comments: A dry month was made even drier by the fact that 85% of the total monthly precipitation fell on one day. 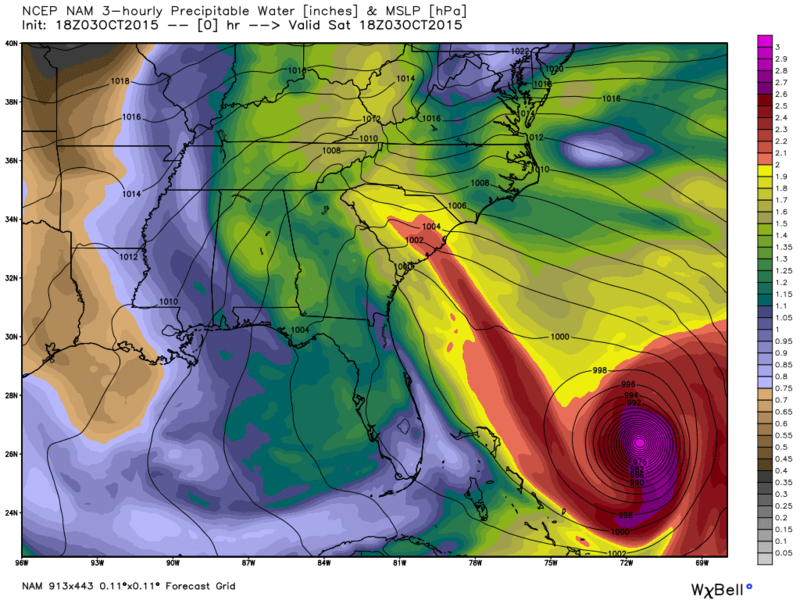 An upper-level weather pattern that is fairly unusual is combining with the strongest hurricane of the year to produce varying rare conditions locally and across the Southeast. Starting outside the Mid-South, Hurricane Joaquin has gotten even stronger today as it departs the rain and wind-lashed Bahamas, heading on a northeast track that will take it well offshore the U.S. and side-swiping Bermuda. 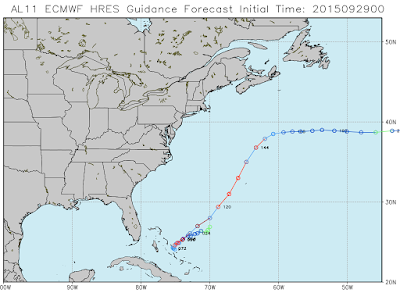 Major Hurricane Joaquin with 155 mph wind departs the Bahamas heading northeast into the western Atlantic. Just a notch below category 5 status at 155 mph sustained wind, the hurricane is not having a direct impact on U.S. weather. However, indirectly it is contributing to a potentially catastrophic flooding event, as described by NOAA, over parts of the southeast U.S., most directly in the Carolinas and northeast Georgia. As shown in the graphic below, a river of water-logged air extends from Joaquin into SC, which is feeding persistent heavy rain, dropping multiple inches per hour in some cases! Precipitable water (PW) values of 2"+ (red) are clearly seen being drawn into SC from Joaquin this afternoon, creating flooding rainfall. Graphic courtesy WxBell. Portions of South Carolina are experiencing record rainfall and possible catastrophic flooding along the lines of a 500-1,000-year event, according to the Weather Prediction Center. 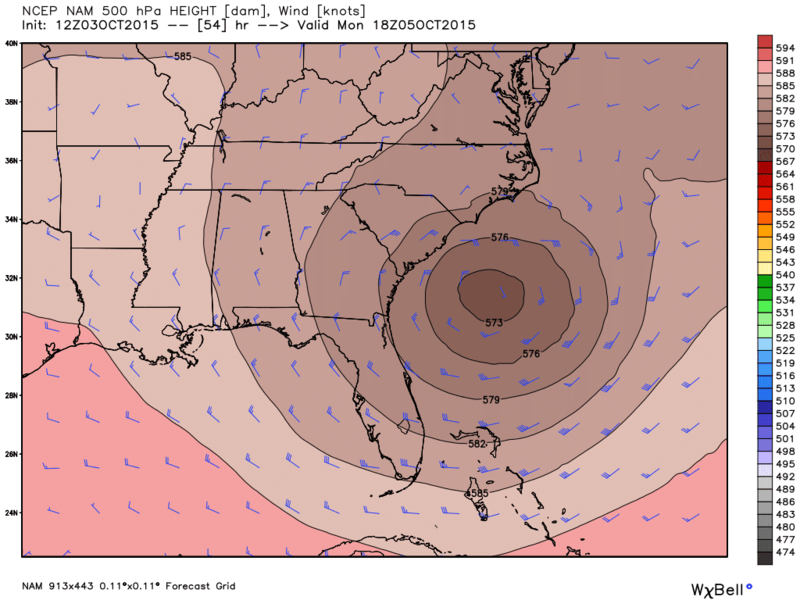 Areas like Charleston, SC are receiving record rainfall that are being attributed to Joaquin by some, but really is the result of a deep upper-level low pressure system over the southeast U.S. (shown below) that is helping to draw Joaquin's moisture into the region. 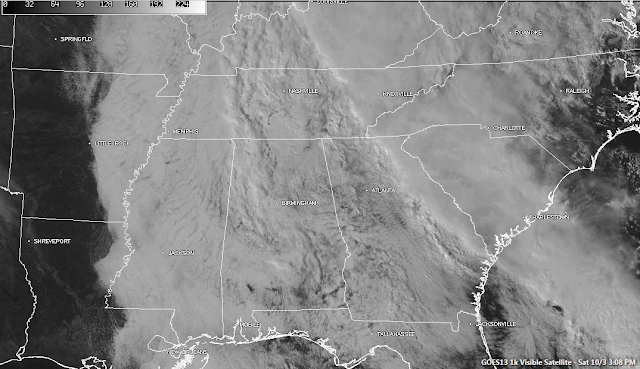 That same upper low is also responsible for our overcast and chilly conditions in the Memphis metro. A large upper level low over the southeastern U.S. is drawing abundant moisture from Joaquin (lower right), as well as creating cloudy, cool conditions over the Mid-South. Graphic courtesy WxBell. On the backside of the low, in the Mid-South, persistent northerly flow around the low and moisture wrapping around said low has created cloudy skies the past couple of days, keeping temperatures well below normal. In fact, today's high temperature will be a record cool max topping out (so far) at 59° in the wee hours of this morning. Add a north wind at 10-15 mph and sweatshirts and jackets have been retrieved from the closet as fall has arrived! Early afternoon visible satellite imagery shows persistent cloud cover over all of the southeastern U.S., including the Memphis metro. Over the next couple of days, the southeast upper low will weaken a bit and move east as Joaquin moves out, allowing for some sunshine to re-appear in the Mid-South sky. A little is possible tomorrow afternoon, which will help temperatures warm back to the mid 60s to near 70 depending on how long how solar radiation we receive. By mid-day Monday, the upper low will have shifted offshore and weakened slightly, allowing high pressure to build into the Mid-South, warming temperatures and bringing more sunshine. Graphic courtesy WxBell. By Monday, we'll be back near 80 with more sunshine expected. Conditions remain dry into next week as temperatures warm back into the mid 80s for much of the week, a result of high pressure at the lower and upper levels taking hold. The next chance of rain doesn't appear until late in the week as the next frontal system approaches. 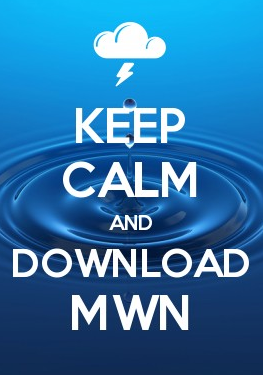 Keep track of the latest forecast on our mobile website or in the MWN mobile apps (link below).